Verandas have been popular for many years, but in recent time’s glass verandas have increased in popularity and now a glass veranda is a popular choice for many different designs of homes and gardens. Many people in Britain like to spend their summers in stylish verandas. Verandas also continue to sell well during autumn months; they give a chance for homeowners to spend more time outside their homes, enjoying their gardens atmosphere, regardless of the weather. A glass extension veranda not only brings more value to your property but also improves the quality of life within it. Even if the weather is unpredictable, the glass veranda can provide a comfortable place to entertain friends and family as well as relax in your garden, without braving the elements. Choosing the right glass veranda, for your home can be a little daunting. There are many factors which need to be considered. Immediately the budget is paramount as glass verandas range from around £1000 for a traditional lean-to glass veranda, upwards of £50,000 for a custom glass veranda extension with glass walls.When it comes to shape and style, many companies provide free advice on the designs and decisions that people may want to make and whether or not they will need any planning certification. The following points will help you make these initial decisions. At first, a homeowner needs to think of what construction materials should be used. Many conservatories are manufactured using a glass which is double-glazed and fixed together using aluminium or a uPVC frame. Therefore, you should decide which style works for you and your property. Secondly, you will need to decide how many walls you require. Moreover, you should decide if the glass walls should have the same length or be of different lengths. A homeowner should also decide whether the roof will be pitched or horizontal. Here, the owner will decide if an oversail will be a good option for them. This is an important aspect to consider regardless of whether the glass veranda will have a modern or classic look. Moreover, the homeowner should decide how they are going to use the space since as it is critical for the design decision making. For instance, the homeowner might decide to use the newly created space for entertainment purposes, an office, or even as a kitchen/diner. Finally, homeowners should put into consideration the way the glass veranda will look. Here, the owner can decide if the space will have bi-folding doors or will be enclosed. The doors can be fixed a few meters from the roof edge and leave out an area protected by the oversailing. Also, they can be placed at the final point of the glass veranda and can be directly open into the garden. This creates a magical and inviting entrance. Glass verandas traditionally do not have walls and are just a sloping structure which protects the area below from rainfall. However, more and more people are opting for garden rooms, basically a veranda with glass walls, offering more protection from wind and rain. Although these steps may appear a little hectic, it is worth taking the time and effort to design the glass veranda, which can greatly transform your property and offer a welcoming and comfortable place for friends and family alike. Glazed extensions can make a real design statement and are hard to beat for the wow factor they provide. With modern technology you can have a space that can be used all year around. 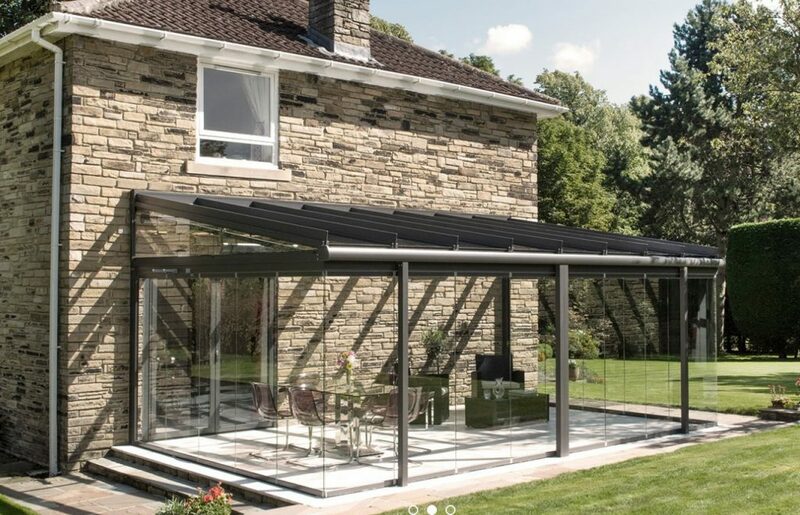 For specialist advice on glass verandas or glass extensions click here for more information. Extending your living space using a veranda or extension will let you enjoy your outside space more whatever the weather. Flooring is also a vital choice, if you are going for an extensions a concrete base will be required, but if it is just a veranda you could go for composite decking which is weatherproof and will not rot, or paving slabs the choice is yours.